The Walther PPQ is a short recoil-operated locked breech semi-automatic pistol that uses a modified Browning cam-lock system adapted from the Hi-Power pistol. 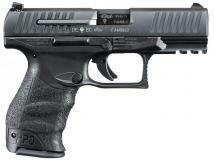 The PPQ has a glass fiber-reinforced polymer frame and steel slide assembly. It can be broken down into its main parts or field stripped with a take down catch without the help of tools. The internal preset striker 'Quick Defense' trigger of the PPQ is a departure of previous Walther pistols and has been developed for the PPQ. When the trigger is pulled the trigger bar engages a disconnect lever, which props up a sear hook, which releases the fully pre-loaded striker assembly, firing the pistol. Pulling the trigger does not partially load the striker spring as with the Glock and many other striker fired pistol designs. The PPQ trigger pull is entirely due to the trigger and disconnector springs. The PPQ has a trigger travel of approximately 9 mm (0.4 in) with a relatively short trigger reset of 2.5 mm (0.1 in) and a trigger pull of approximately 25 N (5.6 lbf). Unlike many other trigger systems, preset internal strikers have a let-off point and trigger pull that remains unchanged from the first shot to the last and requires no decocker. It should however be noted that the striker of the PPQ variant does not protrude from the back of the slide, as the firearm is in a constant cocked state.